Death to the bland, boring, overcooked, undercooked, crappy, token veg option on the menu: risotto. Seriously, how can this dish be so consistently underwhelming? We are uncertain, but what we do know is how to do it right. Sure, you have your mushroom risottos, but here we have taken it up a notch, and we can help you step up your risotto game, too. This one is undeniably good and a really pretty colour. Step it up, friends. 1. In a shallow casserole dish or large saucepan, heat the olive oil over a medium heat and add both onions with a big pinch of salt. Fry until the onions begin to soften. 2. While the onions are cooking, prepare the broccoli for the pesto. Bring a small saucepan of salted water to the boil and blanch the broccoli for 3-4 minutes, or until just cooked. Do not overcook; you want to keep that bright green colour. Drain the broccoli in a colander and run it under cold water until cool. Set aside to drain. 3. Using the same pot that you used for the broccoli, heat the stock until hot. Add the garlic to the onions and cook out for a second, then add the rice. Stir well to coat, then cook over a low heat until the grains begin to look a little translucent around the edges. 4. Slowly begin to add the warm stock to the rice – about 250ml (1 cup) at a time. Stir, almost constantly, over a low heat until the rice is just cooked through and creamy. If you don't need all the stock, don't use it. Different brands of rice need slightly different amounts of stock, so use your best judgement. 5. While the risotto is cooking, make the pesto. In a blender or food processor, combine the broccoli with all the pesto ingredients and blend until smooth. 6. 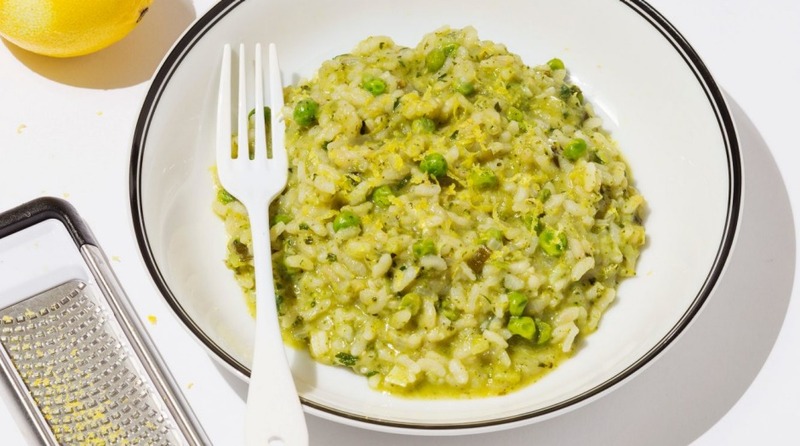 Once the rice is cooked – not mushy, but just cooked (about 25 minutes) – add the peas and allow to cook for a couple of minutes. Remove from the heat and fold in the pesto. Sprinkle with some parmesan, if using, and a good crack of black pepper. 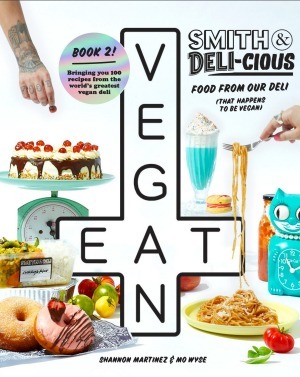 *Track down Green Vie vegan "parmesan" and your life will be changed forever. In Shannon's opinion it has the cheesiest flavour – with the natural umami taste – of all the vegan cheeses. 1. Combine the stock, kombu, ginger, garlic, mushrooms, kimchi juice and spring onion ends in a large, shallow saucepan and bring to the boil, then turn off the heat. Strain, discarding the solids, and return the stock to the pot. Add the gochugaru, fish sauce, sesame oil and gojuchang and stir to combine. 2. Remember, this is a very visual dish and you'll be eating out of the pan you're cooking in. 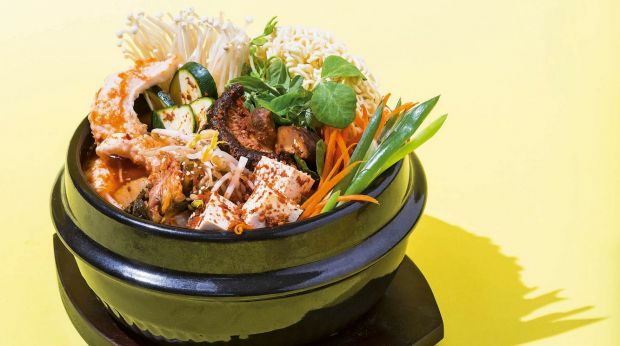 Arrange your choice of vegetables, tofu, noodles and other toppings like a wheel of fortune in the base of the saucepan, but don't put similar colours together. 3. Carefully pour over the stock and bring to a simmer over a medium-low heat. Simmer gently, for 5-10 minutes, until the noodles and vegetables are cooked. Garnish with the sesame seeds and coriander. 4. Allow your friends time to take their Instagram photos of the dish before you mix it up. Put your rice and hotpot in the middle of the table and let everyone serve themselves bit by bit. Just make sure they're getting all the delicious components. *Go to the effort to find vegan "fish sauce" in your local Asian market or health food store. There are brands that produce amazing versions – simply ask your local shop to stock it. Yes, you can go without it in most recipes, but they won't be as good.